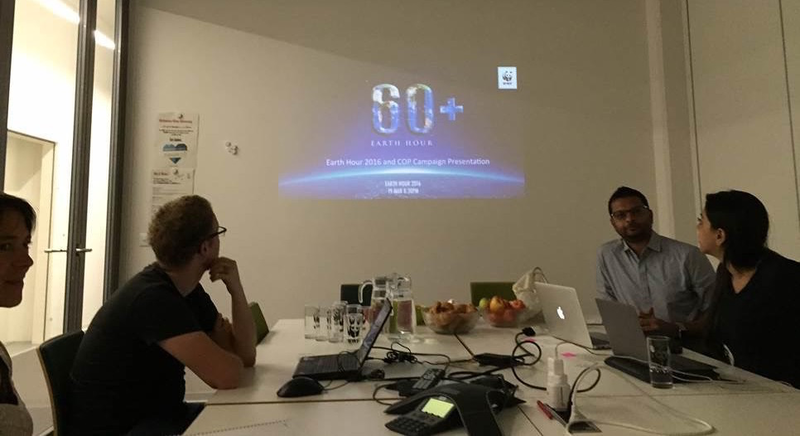 In recognition of the value and potential of the DecarboNet project to the Earth Hour campaign, key members of the Earth Hour Global (EHG) organisation met in Zurich with Christoph Meili, Raphael Hess, Harith Alani, as well as several others from WWF Switzerland. In this meeting, EHG demonstrated their plans for future Earth Hour campaigns, and described how the new campaigns are firmly pinned on social media. Christoph gave an overview of the public engagement activities championed by WWF Switzerland, and Harith presented the various analysis and tools produced by the project, and described their role in supporting the campaign. EHG showed a great overall interest in DecarboNet and praised its achievements and outcomes. For example, they regarded the Media Watch for Climate Change as an essential tool to help them acquire a quick understanding of media coverage of a given campaign, what the key discussed topics are, and how they connect and correlate. They were also very keen on the social media analysis of Earth Hour, to obtain deeper insights into the effectiveness of the campaign and its long-term impact on people’s awareness and behaviour, and how public engagement could be increased using machine-learnt tweeting patterns. The meeting was regarded as extremely productive and successful by both parties, and a close collaboration plan was agreed around COP21 and Earth Hour 2016 campaigns.